Today, I am grateful for the worms who make their home in my worm box. In a most simple and amazing way, as a digestive tube, these lovely beings take my scraps, process them through their bodies and reward with castings. What a wonderful symbiotic relationship! My task was to take the rich castings from the worm box while leaving my little friends to eat another day. I simply dug in, with both hands, picking out the wigglers and lifting them back into their home. 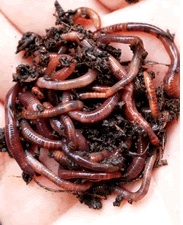 The worm castings nourish all vegetation. Today, April May June the Japanese Maple reaped the benefits of the worm's recycling skills. I love the cyclical nature of our world.